Compare SLT with medical therapy as first-line therapy for the management of OAG. Develop appropriate treatment goals for patients with newly diagnosed OAG based on disease status and risk profile. Describe the epidemiology of myopia and the pathophysiological mechanisms by which glaucoma develops in myopic eyes. Describe techniques for detecting early glaucomatous changes in myopic eyes and potential therapeutic interventions for preventing myopia and progression to glaucoma. Identify factors that contribute to ocular surface disorders among patients undergoing medical treatment for glaucoma. Modify management to counter ocular surface disease in glaucoma patients. Describe the main categories and clinical presentation of secondary glaucomas outside of the exfoliative and pigmentary types. Describe treatment management strategies, and anticipated complications that may be involved, for these secondary glaucomas. Improve differential diagnosis of PXF and pigmentary glaucomas. Appropriately use different treatment modalities in the management of PXF or pigmentary glaucoma to control IOP and prevent disease progression. Identify patients with posture- or sleep-related factors that may be exacerbating their glaucoma. Recognize the role of sleep apnea and vascular dysregulation on glaucoma physiology and management. Take steps to reduce nonadherence among glaucoma patients. Identify glaucoma patients who may benefit from sustained-release therapies by increasing awareness of nonadherence with eye drop treatment. Compare different drug-delivery systems developed for glaucoma based on considerations of efficacy, safety, and practicality. Ocular Perfusion Pressure: An Important New Parameter? 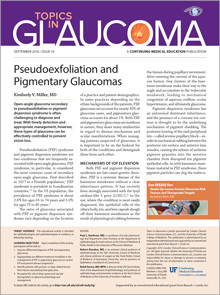 Assess the significance of ocular perfusion pressure as a risk factor for glaucoma. Outline the potential role of low CSFP in the development of glaucomatous damage. List the significant risk factor for the development of glaucoma in patients with ocular hypertension. Devise appropriate management plans based on patients’ risk profiles and suitability for treatment. Review etiologic factors that may contribute to the development and progression of NTG. Differentially diagnose NTG from POAG and nonglaucomatous optic neuropathies based on clinical findings. Describe proven risk factors for POAG, including anatomical/structural risk factors. Characterize the relationship between IOP and CCT. Combine structural and functional assessments to evaluate glaucoma progression. Optimize frequency of optic nerve and visual field evaluations to monitor the status of glaucoma. Cite anticipated changes in glaucoma management in the next 5 to 10 years. Discuss the potential for nerve regeneration as a treatment for glaucoma. Differentiate normal and abnormal IOP fluctuation. Detect and manage IOP fluctuation in appropriate patients. Evaluate potentially IOP-lowering strategies related to posture and biophysics. Discuss and recommend plant and lifestyle-based modalities to glaucoma patients. Identify patients at risk for PACG. Describe the requirements and tools for PACG diagnosis. Describe the effect of cataract surgery on IOP and state proposed mechanisms for this effect. Take into consideration the IOP-lowering effect of cataract surgery in selecting the appropriate surgical treatment for coexisting cataract and glaucoma. Distinguish current glaucoma medications based on their mechanisms of action. List three new drugs that are being developed to treat glaucoma. Devise a viable strategy for IOP measurement within their practice. Describe the limitations of technologies they are currently using for IOP measurement. Create a staged management plan for patients with glaucoma. List steps to take in the event that target IOP is not maintained. Describe structural and functional bases of aqueous humor formation and outflow. Use aqueous humor pathophysiology to interpret ocular hypertension and the mechanisms of action of current pharmacological therapies for glaucoma. Characterize four classes of IOP-lowering medication. State the rationale for medical therapy in the treatment of primary and secondary glaucomas.